Let's give thanks to Gouda. No seriously...thank you, cheeses! I should explain that my parents have taken to a (fantastic) new holiday tradition that involves two very unrelated things: nuns and cheese. 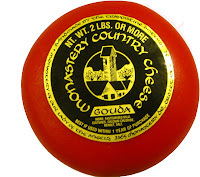 Every year sometime around Thanksgiving, they have a perfectly round, two pound Gouda shipped to our house. And this delicious cheese was made by nuns in a Cistercian monastery located in Crozet, VA. Turns out, the Trappist (Cistercian) nuns of Our Lady of the Angels Monastery know a thing or two about curds. 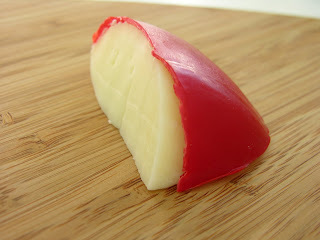 They handcraft a “traditional old-style Gouda” that is aged a minimum of two months. This cheese is creamy, buttery and good for snacking or melting. Also, if you want to let it age further in your refrigerator, it will supposedly allow the flavors to develop even more. I have never really had the cheese around long enough to “age.” We typically break into it as soon as we can find a knife sharp enough to cut through the wax. As always, enjoy your cheese responsibly by bringing it to room temperature before eating and by storing it in either an air tight container or cheese paper. The nuns also suggest leaving as much of the wax on the cheese as possible, only cutting off as much as you need and coating the exposed part of the cheese with butter or olive oil to protect it. To get yourself closer to Gouda, email the monastery at cheese@olamonastery.org or check out their website at http://www.olamonastery.org/.